It's always risky to assume too much. 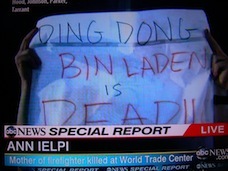 But it seems relatively safe to assume that the great majority of American television viewers didn't mind the last portions of their Sunday night entertainment programs giving way to news that Osama bin Laden had been shot and killed in his Pakistan lair by U.S. forces. In D-FW, the ratings began ballooning at 9:45 p.m., when ABC, CBS and NBC respectively bailed out of new May "sweeps" episodes of Brothers & Sisters, CSI: Miami and The Celebrity Apprentice. Fox4, three-quarters of the way through its regular 9 p.m. newscast, began simulcasting the breaking news coverage from Fox News Channel. Let's start with the total viewer numbers from 9:45 to 10 p.m. on those four stations plus CNN, Fox News Channel and MSNBC. President Obama sounded the official death knell for bin Laden with a 9-minute address to the nation that ran from 10:35 to 10:44 p.m. Since Nielsen Media Research measures in 15-minute increments, here are the D-FW total viewer numbers from 10:30 to 10:45 p.m.
Fox4 then made the questionable decision to end its bin Laden coverage immediately following the president's speech. The station instead aired anchor Mike Doocy's regular Sports Sunday program, followed by the reliably sleazy TMZ. 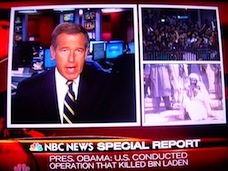 The NBC and CBS networks continued their bin Laden coverage until 11 p.m. before yielding to local newscasts. ABC went all the way to midnight, and WFAA8 continued with the network coverage for that entire hour before going to its local newscast. Here are the D-FW total viewer numbers from 10:45 to 11 p.m., when only Fox4 was without bin Laden coverage. The bin Laden coverage from 11 p.m. to midnight on ABC/WFAA8 comfortably won its time period against local news/sports/entertainment offerings on Fox4,NBC5 and CBS11. The continuing coverage, anchored very capably by George Stephanopoulos, averaged 200,845 viewers in that hour; CNN led the cable news network brigade with 131,588 viewers. Stephanopoulos briefly chuckled, rather than snarled, when the mother of a firefighter who died in the 9-11 attacks told him she first heard the news of bin Laden's death from Geraldo Rivera on Fox News Channel. Oh well. Earlier Sunday, ABC's big Round 2 NBA playoff matchup between the Miami Heat and Boston Celtics drew a nice-sized 249,325 viewers to easily lead all daytime programming. Moving to Friday's early morning hours, there was a little thing called the Royal Wedding that all of the broadcast and cable networks also gang-covered. We've already posted the available national ratings on the Network News & Reviews page. In D-FW, NBC's Today coverage had the most viewers, peaking at 214,697 between 6:45 and 7 a.m. ABC's Good Morning America ran second, with a peak viewership of 159,291 between 7:15 and 7:30 a.m. CBS' The Early Show as usual finished a distant third, hobbling along with a peak crowd of 90,034 viewers between 6:15 and 6:30 a.m. In Friday's prime-time ratings, however, CBS' 7 p.m. Royal wedding recap drew the most viewers with 159,291. From 8 to 10 p.m., NBC and ABC dueled with two hour William & Kate specials, with the Peacock winning by a nose -- 103,886 viewers to 96,960. The most-watched prime-time attraction, a new 9 p.m. episode of CBS' Blue Bloods, had 242,400 viewers. Friday also marked Day 2 of the May "sweeps" ratings period, with the 6 a.m. local news competitions washed out by the Royal wedding. At 10 p.m., CBS11 ran first in total viewers but NBC5 won among 25-to-54-year-olds, the main advertiser target audience for news programming on most stations. The Peacock is showing increased strength in this key demographic despite being saddled with ratings-starved NBC lead-in programming on most nights. Fox4 flexed in the early evening, running the table at 6 p.m. while also notching a 5 p.m. win with 25-to-54-year-olds. WFAA8 ran first at 5 p.m. in total viewers.